It is estimated that there are well over a million houses in Guatemala cobbled together with cornstalks, cane, and scavenged materials. During the wet months - from June to November - wind driven rain blows through the wall, drips from the roofs, and often turns dirt floors into parasitic muck. Of course lattice-like walls provide little privacy and no security – leaving a family’s belongings subject to theft as well. GHA offers modest but dry and secure homes for families living in extreme poverty. Our homes are about 15'x18', with two adjoining rooms if the family so desires. Our first 20 homes were built of high quality blocks, stucco’ed to ensure protection from the rain. Floors are finely finished, easy to clean cement, a real boon for the health of the family. The metal door and three windows add light and ventilation. Being in an active seismic area, GHA opts to use extensive rebar, both horizontally and vertically, to create a protective web within the walls. The cost to build such a home depends on the challenges of the lot’s topography. On the more precipitous slopes, some homes need quite deep anchoring. A GHA home can change the health and welfare of a family for on average $2300. GHA also offers smaller improvements to people who already own homes: Cement floors for cleanliness and health, stucco’d walls for moisture and rain resistance, and roofs if leaking. It is the goal of GHA to build as sustainably as possible. We will always try to use local materials and fabrications (windows and doors) not only to infuse capital closer to home but to avoid transportation costs. We are committed to exploring any reasonable technology that will help employ people locally and minimize environmental impact. 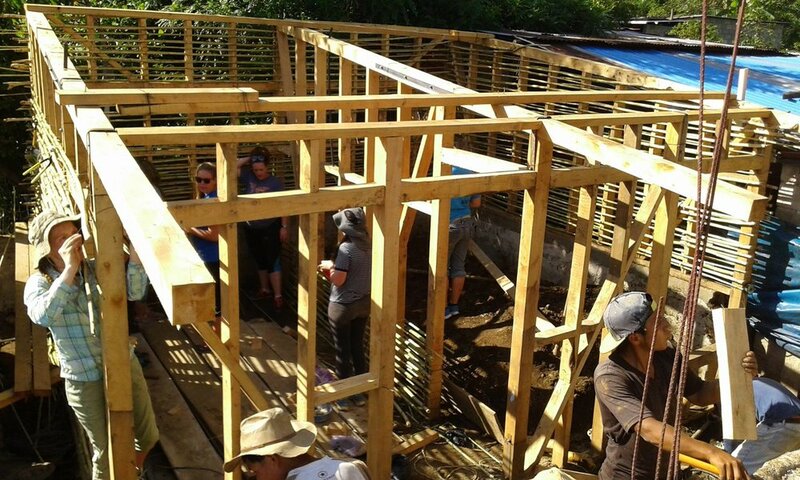 In November of 2015 we built our first Bajareque house, which has the advantage of approaching our goals of sustainability, as well as making a far more attractive and more breathable house. 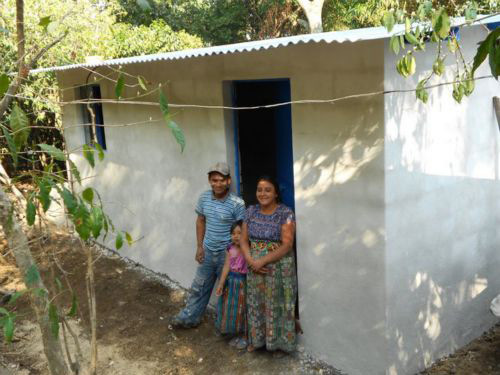 Our first 2 Bajareque homes used bamboo, pine needles, adobe mud, local pumice, lime and can~a. They are VERY beautiful. In 2016 we exchanged the bamboo for cypress, a wood that repels both insects and rot. These are still 'hybrid' homes, as we have yet to find a good, easily and inexpensively maintained floor application to take the place of cement. A Guatemalan family sharing the cooking and eating of a meal in a typical Guatemalan house. The family stands in the doorway of their newly built house.